The RoC Soleil-Protect Anti Shine Mattifying Fluid SPF30 is formulated with anti-oxidant, this fluid not only protects skin's youthful appearance, but also visibly reduces shine for visibly better looking skin. Clinically proven, it acts in 2 ways to protect and visibly improve the overall appearance of the skin. It protects skin's youthful appearance, thanks to high performance UVA & UVB filters, it offers high sun protection and prevents from premature skin ageing, wrinkles, sagging, age spots. This fluid is also formulated with Feverfew, a powerful antioxidant. It provides a rejuvenated complexion, thanks to mattifying micro-sponges, this fluid improves the look of skin by visibly reducing shine. As light as a daily moisturiser, its ultra-light fluid texture is comfortable to use, penetrates rapidly and leaves no white residue. Explore the entire range of Face Sunscreen available on Nykaa. 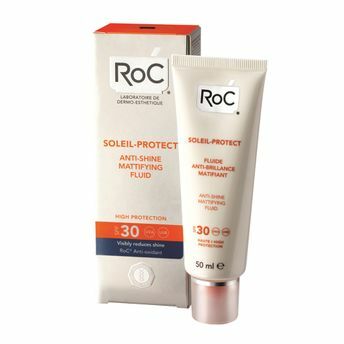 Shop more RoC products here.You can browse through the complete world of RoC Face Sunscreen .